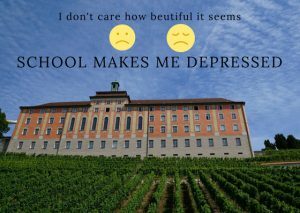 The feeling of depression from school is born mostly in teenagers and kids because school is designed not to be a pleasant and happy place to entertain, but to study and learn. The school curriculum consists of the subjects that the government think are appropriate for students and not what actually is useful and relevant in today’s world. What is counterintuitive is that we can learn better if we feel happy and at ease, and this is because our cognitive processes work without the need to deal with the stress that we get from an unpleasant environment. Think about it, passing tests, doing homework, get good qualifications to get accepted into college, so later we get a better (society) status from our academic efforts to get qualified for a job and earn money. I get it, school is stressful and we get tired of dealing with this stress and over some time we can even get very depressed after being tired of fighting that stress. Another factor that I’ve considered about being depressed by the school is that teenagers feel they have a lack of control over their lives and doesn’t know how to get back that control. They don’t own their own lives, but teachers, bullies, parents, essays and a whole dimension of endeavors expected from them to be someone resourceful in our society. If School Makes Me Depressed, Then What Should I Do? The first thing to do is to recognize that life is not an easy ride on a rollercoaster. There are ups and downs that life shows us and things can turn for the better in any given turn. Stay positive even when it feels is going insane mod on you. Once you are determined on dealing with the depression the best thing to do is always to talk with someone like a counselor, but definitely, do not try to deal and solve it all by yourself, the way uphill is a lot more difficult and treacherous doing it alone. Most teenagers don’t know what they want in their life (don’t have a definite chief aim) but I’ll give you this advice anyway, maybe school makes you depressed because school is not for you. Period. School is not for everybody and a lot of millionaires and billionaires dropout school can testify that for you. If it’s school that’s depressing you and if you want to start a business or follow your dream and that doesn’t require a college degree, then you should have a serious talk with your parents, because this is serious stuff to talk about. Things are not easy in this life, but before you attempt to do anything drastic, make sure that is in your best interest, don’t take my advice of dropping out the school just to play video games and chill out in life, because life will not chill out on you unless you become someone valuable.